Dear Mona, What Percentage Of Women Have Breast Implants? Pamela Anderson filming a “Baywatch” episode in Mailbu, California. What percentage of women have breast implants? After receiving her breast implants in an experimental surgery, Esmeralda, a dog of unknown breed, chewed at the stitches until they had to be removed. The operation was still deemed a success, and the surgeons, Frank Gerow and Thomas Cronin, began searching for a way to test the procedure on a human female. Not long after, Gerow offered his new silicone products to Timmie Jean Lindsey, a 29-year-old mother of six who agreed to the procedure on the condition that Gerow would also “fix” what really bothered her — her “Dumbo” ears. And so the world’s first breast implant surgery was performed at Jefferson Davis hospital in Houston, Texas, in 1962. Lindsey received her breast implants more than 50 years ago, but national statistics on the procedure have only been collected on a yearly basis since the late 1990s. And those statistics only measure the number of procedures that take place; they say nothing about the women receiving those implants, which makes an estimate here all the more shaky. Still, though, I estimate that almost 4 percent of women in America, or one in every 26, has breast implants. Here’s how I got to that number. 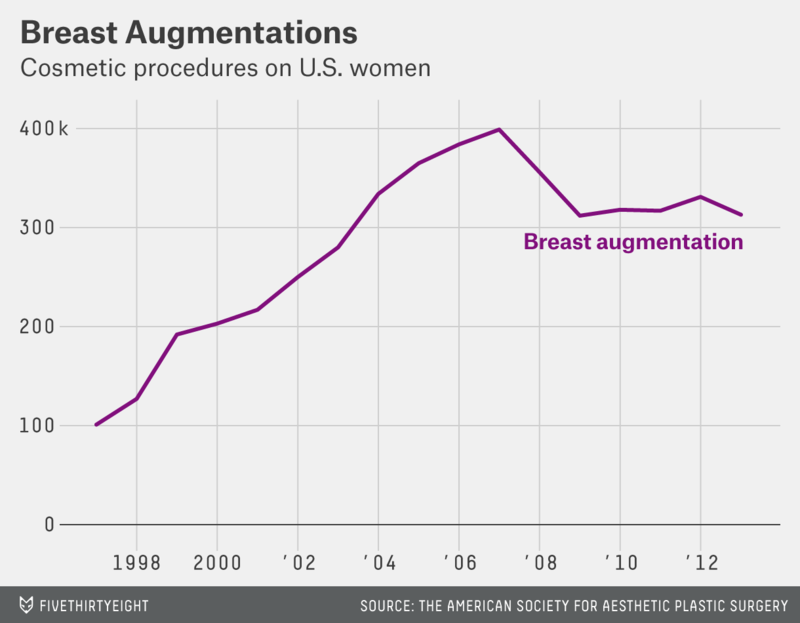 I looked at the number of breast augmentations that have taken place each year since 1997, according to the American Society for Aesthetic Plastic Surgery (ASAPS). Unlike other professional organizations for certified surgeons, ASAPS members specialize in cosmetic surgery, so these numbers, collected from surveys of surgeons, should exclude reconstructive surgeries for women who have lost one or both breasts after mastectomy surgery. I simply added up all of those procedures (a total of 4,798,349 since 1997) and divided it by the current U.S. female adult population (124,501,374) and arrived at the estimate that 4 percent of American women alive today have had breast implants. I assumed that each procedure for “breast augmentation” involved implants. In reality though, a fraction of these will use a woman’s own fat rather than implants to increase the size of the breast. In “fat transfer breast augmentation,” liposuction is used to move fat from one part of the body to the breasts (breast-lift surgery is counted as a separate category). That means that 4 percent is an overestimate. I assumed that one procedure equates to one woman. That means this is an overestimate because in reality some of these procedures will be revision surgeries (i.e. intended to fix or improve the initial result). I assumed that none of the women who received breast implants since 1997 has since died. That means that this is an overestimate. I assumed that each woman kept her breast implants. 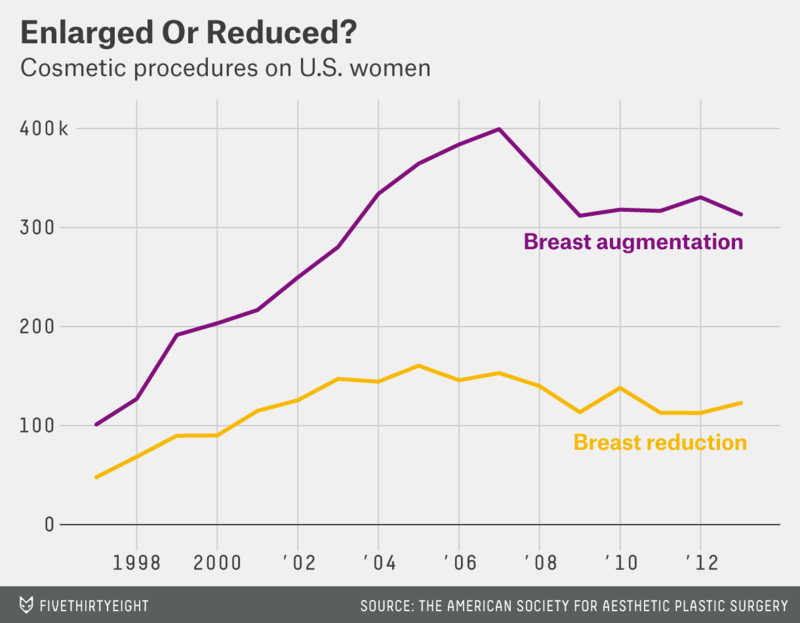 Removal of breast implants counts as reconstructive surgery, so I contacted the American Society of Plastic Surgeons (ASPS) which, unlike the confusingly similar ASAPS, doesn’t just collect statistics on cosmetic surgery. ASPS statistics show that in 2013 alone there were 23,770 breast implant removals. That means this is an overestimate. I assumed that these procedures were performed on U.S. women. In reality, some of those operations would have been performed on women who have subsequently left the United States — and some women currently living here will have received their breast implant surgery abroad. There is scant information about the scale, direction of travel or most common operations performed in cosmetic surgery tourism, so I can’t say whether that makes this an overestimate or an underestimate. My total doesn’t include women who got implants before 1997. That means Timmie Jean Lindsey (now an 82-year-old great-grandmother) and thousands that came after her aren’t counted. Even as early as 1989, a survey of 40,000 American households estimated that there were 815,700 women with breast implants in the U.S. That means this is a considerable underestimate — which I can only hope outweighs the factors above. There’s another trend here, though. For every two women who have had breast implants since 1997, there was one woman who went under the knife to have her breasts reduced. It’s also easy to overlook the fact that men have breast reductions, too (it may even come as news to some that men have breast tissue). In addition to the numbers listed here, a further 22,939 breast-reduction procedures were carried out on men in 2013 to address gynecomastia, or enlarged breast tissue. 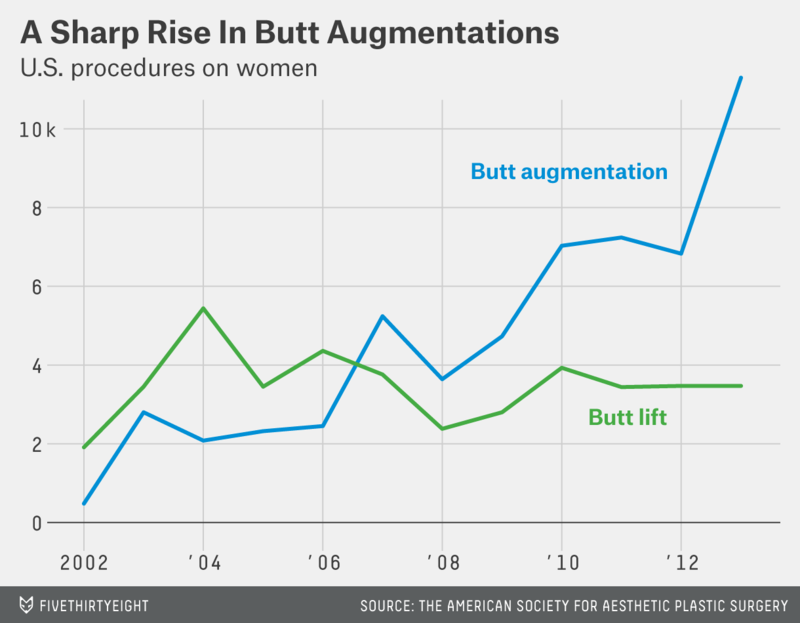 Although breast implants remained the most common surgical cosmetic procedure for women last year, coming up from behind is a big rise in buttock augmentation. I have no idea how many of the 4 percent of women that I estimate have breast implants also have their bums augmented, or any other cosmetic procedure for that matter. Nor can I tell you much about the number of men who undergo multiple procedures. But there is data on the reasons why people choose to get cosmetic surgery, which (while we’re talking about possible vanity) you can discover in my interview with NPR last week.